East Palo Alto is a tough town to grow up in. There’s a lot of love and community, but also a lot of gang activity centered around turf and drug sales. A lot of young people have died before their time. Others have wasted many years in prison. 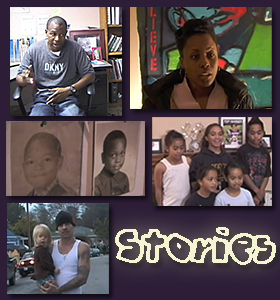 In 2009, two organizations got together to create a media project that would shine a light on exemplary folks who found a positive pathway threaded through the violence, or who had turned their lives around from the lure of gangs, easy money, and violence. The Midpeninsula Community Media Center and For Youth By Youth (FYBY) combined their resources to create the five video profiles you see on this site and seven spoken word pieces. The stories were videotaped and edited by high school youths in FYBY and the spoken word pieces were done by a variety of local youths. Thank you for viewing these works. We welcome any feedback you provide us. If you are from another community, let us know. We think we will discover that these stories are not limited to East Palo Alto, CA.